Potsdam is one of the most colorful cities in Germany. Situated close to the capital of Berlin, Potsdam lies in the eastern part of the German state of Brandenburg and passing through the city is the beautiful River Havel. Potsdam covers an area of 187.28 sq km, with a population of nearly 150 000 inhabitants. Potsdam is located 24 kilometers southwest of Berlin and enters into the composition of the Metropolitan area of Berlin Brandenburg. Potsdam in Germany is like Windsor in England. By 1918 the city was the official residence of the Prussian kings. In the 19th century Potsdam established and maintained their traditions in science and research and there are over 30 colleges and research institutes. In the region of of Potsdam Babelsberg is located, which was the largest commissary for the production of films before World War II. After the fall of the Berlin Wall, Babelsberg importance began growing and it remained one of the main places for the movie industry in Europe. Bebelsberg studio has a great historical significance because it remains the oldest. For thousands of years in the area of Potsdam civilization has emerged. From 1317 Potsdam was referred to as the small town. In the mid-16th century, around 1573, data indicates that Potsdam was still a small village with a population of about 2000 inhabitants. After the devastating Thirty Years War between 1618 and 1648 Potsdam had lost almost half of its population. Potsdam began to dramatically change its appearance when in 1660 it was elected the hunting residence of Frederick William I. Potsdam was the core of the powerful emerging future of the Prussian Kingdom. A little later the town became entirely within the residence of the royal family of Prussia. Majestic buildings which the royal family used to reside, were built mainly during the reign of Frederick the Great. 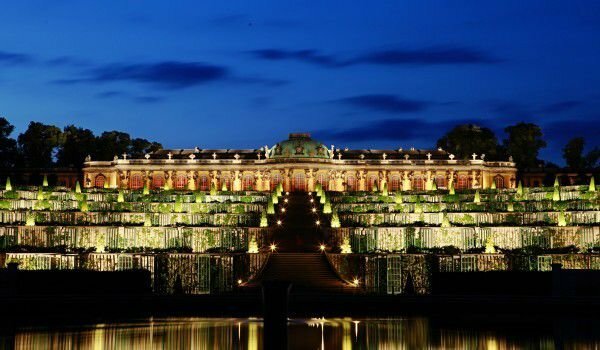 One of these residences is the, palace Sanssouci, which to this day remains a major tourist attraction in Potsdam. This beautiful and imposing palace was built by Frederick the Great, like the one in Versailles. 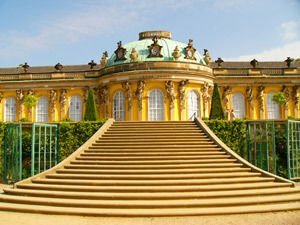 The architectural style of Sanssouci is underlined in the Rococo style. The palace is relatively small but has a huge and incredibly beautiful park with its adjacent gardens. The Palace brings more than 200 years of history. Planned for summer residence the Palace retains its charm during all seasons of the year, and today, centuries after its construction, has a huge tourist attraction. The Palace was built of yellow plaster, with high arched windows and six large terraces with lush vegetation of orange trees and vineyards. It only has 12 rooms but each is furnished with great style and complemented with valuable works of art. Today one of the most impressive parts of the palace is the art gallery where you can see works by Rubens, Van Dyck and Tintoreto.